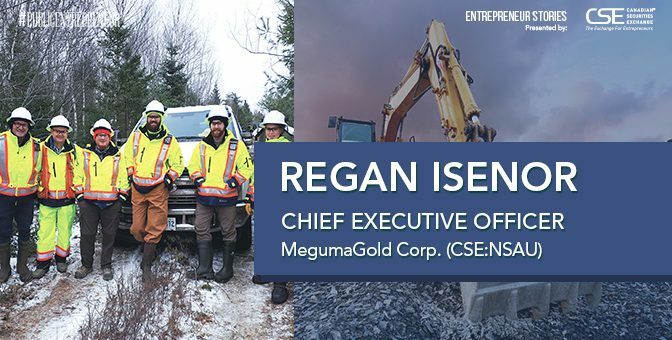 When the Canadian Securities Exchange featured Irving Resources (CSE:IRV) in its quarterly magazine two years ago, the company had assembled a portfolio of attractive projects in Japan and done some early groundwork. 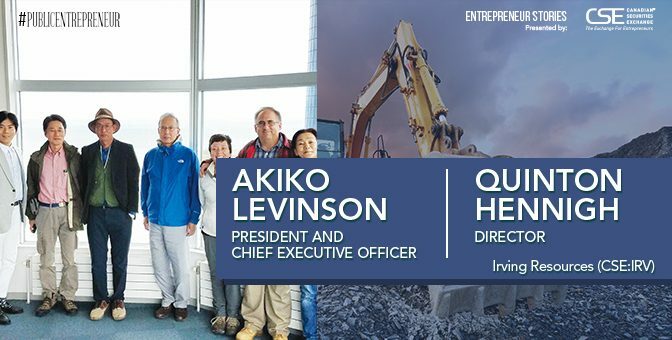 At the time, President and Chief Executive Officer Akiko Levinson and director (and chief geologist on Irving’s projects) Quinton Hennigh spoke of a commitment to exploring methodically and at a measured pace. It was as if they knew they had something special. No need to rush. Fast-forward to the first quarter of 2019 and their thesis is proving right. With samples up to 480 grams per ton gold and 9,660 grams per ton silver, permits in hand and targets ready for drill-testing, progress to date shows that not only are there excellent projects in Japan, but that exploration can indeed be conducted in an efficient manner. The market clearly agrees, having boosted Irving’s share price in the past two years by over 100%. This increase in valuation is even more impressive given that many precious metals exploration companies have seen their share prices implode during that period. 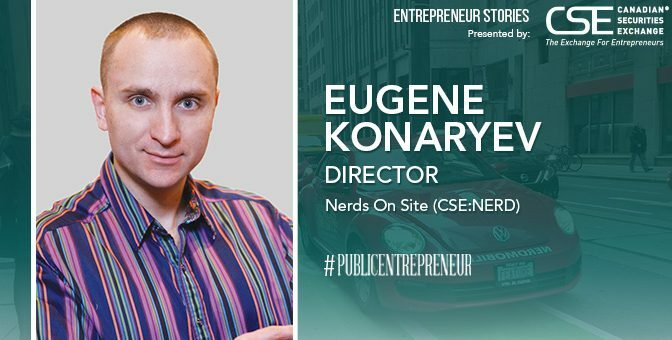 Public Entrepreneur spoke with Levinson and Hennigh in February 2019 to get the latest on achievements to date and what investors can look forward to over the balance of the year. Why did you choose Japan as the focus for Irving’s exploration work? What initially attracted you and why is Japan a good place to explore? 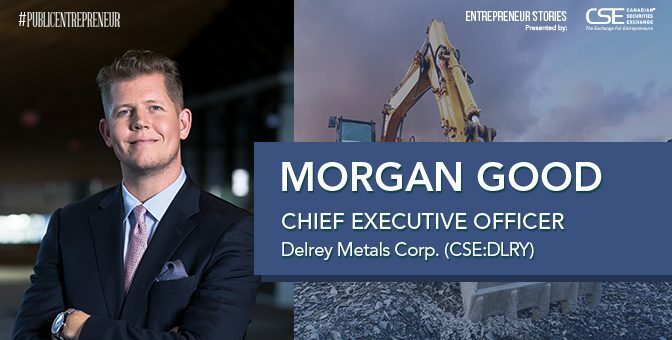 AL: The idea of exploring in Japan began making sense when Quinton and I went there in 2012 and visited the Hishikari mine, which is one of the richest gold mines in the world. Quinton said, “Look, there can’t be just one of these.” So, we started looking for a way of exploring in the country ourselves. That opportunity came in 2015. QH: Japan has not had any exploration conducted for perhaps 30 years. The last major discovery was the Hishikari mine Akiko just mentioned. Japan has been perceived as a country that is difficult to explore in, but when we looked into it we found the situation to be the opposite. Japan is actually quite straightforward to explore in, and now here we are, looking for the country’s next high-grade gold deposit. Talk to us about the regulatory environment. What is the permitting process like? How does it differ from that in countries such as Canada or the US? QH: I would say that the regulatory framework is actually not all that different from in Canada, the US or Australia. It is fairly predictable in terms of the expectations placed on companies. It is straightforward to get permits and so forth. 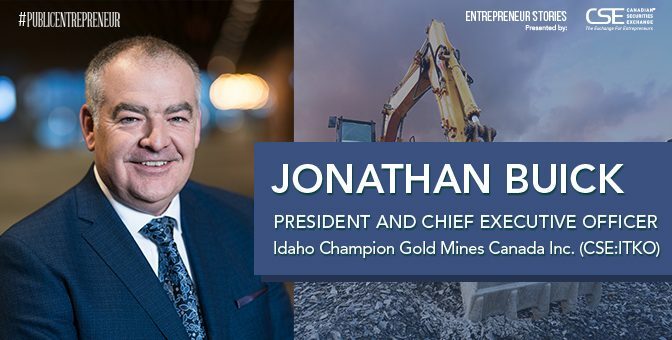 I think the biggest challenge was that some of the people overseeing the permitting process had not really encountered much in the way of mineral exploration for many years, so there was somewhat of a learning curve as they worked on our permits because they simply were not familiar with some of the processes involved. But I think we are past that now and the whole structure is working quite well. AL: When we started this three years ago, this was new to everybody – to METI (Ministry of Economy, Trade and Industry), to Irving, and to the people who help move us through the permitting process. But Quinton says all the time that there really are no surprises. It is very predictable if you go through the process and if you do it diligently. I think that because of Irving and others who are trying to do similar work in Japan, the regulatory system has a better understanding of this process. It is becoming faster. Japan is a highly seismic area – explain how this influences the types of deposits found in the country and how it influences your exploration strategy. QH: The seismic activity is related to the fact that Japan sits on the Ring of Fire. It is part of the Circum-Pacific Belt associated with volcanism and earthquakes as the plates collide. You have the Oceanic Plate under the Pacific Ocean, and the Continental Plates. In this case you have the Eurasian Plate. As those two converge, you generate quite a bit of magma down deep that then rises to the surface and can produce volcanoes – there are numerous volcanoes up and down the Japanese archipelago. That volcanism is actually what leads to the formation of a lot of these gold deposits. The heat associated with the process is very near surface and heats the groundwaters. Those waters carry minerals, including gold, and redeposit them as they come to surface and emerge as hot springs. Japan is well endowed with this environment – there are hot springs from one end to the other. This has been the case for many millions of years. So, Japan has seen a long history of hot spring formation, and we are looking for paleo hot springs – basically old hot springs that would have carried gold up to surface. As a result, deposits in Japan are relatively shallow. Usually when you find an old hot spring, at surface what you see is a terrace of silica, a silica sinter. It is kind of a flat body of silica deposited by the hot springs. From the feeder below, cracks in the ground fed the hot spring water through, and that’s where the gold forms. These deposits are present within a couple of hundred meters of the surface. We’re interested to know about your top projects and why you chose them as the focus of your exploration. QH: The Omu Project is in northern Hokkaido. Omu is centered on a volcanic system that was active about 12 million years ago. We have a history on the property of not only volcanism but extensive hot springs. There are at least three major centers where hot spring waters have surfaced. One of them is at the Omui mine, which is an historic mine that produced maybe a ton of gold in the 1920s. It was very high grade and has seen little, if any, exploration since. The second area we are focused on is the Omu sinter. This is a new discovery that we made a few kilometers due north of the Omui mine. The system is intact, basically preserved in its entirety. The silica sinter is on top and we believe there is potential to find high-grade veins underneath like we see at the Omui mine. It has never been drilled or tested and is thus a brand new exploration target. The third area is in the western part of the Omu property. It is called Hokuryu. Like Omui, it is an historic mine and produced a few tons of gold. It was shut down during the Second World War, well before its resources were mined out. We are a little deeper into the system, as the sinter has weathered away – we are down into the vein system beneath it. There are pieces of vein at surface with an average grade of 50 grams per ton gold and 500 grams per ton silver. It is a very rich and promising new target. I love the story you told once about finding a project after noticing interesting rocks in a local garden. Can you each share with us a favorite story about your exploration work in Japan? AL: Those rocks were actually being used at a kindergarten in an ornamental fence. Our team went to the school and asked where they’d found them. They guided us to the location and that is how we located the sinter. The town wanted to get rid of the rocks because they planned to build something else. They put up a poster saying, “Anyone who wants these, please take them.” We said, ”Yes, we’ll take them!” And now some of them are in our office. They were just going to throw them away. QH: I usually judge geologists by comparing what they talk about to what you see in the field. In other words, if they say, “This is the biggest thing since Ben Hur,” and then you get into the field and it’s disappointing, you know they embellish. Then there are geologists who are low key. They’ll say, “Oh, there is something kind of interesting,” but then you get out in the field and it’s the biggest thing ever. One of our advisors is a gentleman by the name of Hidetoshi Takaoka. Two years ago, we went to Sado Island to visit a historic mine. The mine has a tourist shop in front with a box of rocks you can buy as souvenirs. I picked one up and Mr. Takaoka said, “We can find one better than that. There is a creek near the mine and pieces of ore have washed down the hill over the years.” We crawled down this steep valley just in front of the mine, and after about five minutes at the creek, Mr. Takaoka reaches down and picks a rock out. We crack it open and it is literally full of gold. I knew then that he tends to understate things. It is one of the nicest specimens of epithermal vein I have ever seen. You have tremendous partners in Japan. Tell us about them and how they have contributed to your success. AL: How Irving started was that Quinton and I worked for a company called Gold Canyon and that merged with another company. What was left in Gold Canyon was a joint venture in Africa with the Japanese government mineral agency called JOGMEC. We worked in Africa with Mitsui Mineral Development Engineering Co. (MINDECO). They are probably the top engineers in Japan for mining and exploration. We had already worked together for about 10 years, and when Quinton and I asked MINDECO engineers if they could help us if we did work in Japan, they said they’d assist in any way they could. It has been amazing to have a built-in team from the beginning that is likely the best in Japan. And previously Quinton mentioned Hidetoshi Takaoka. He is the one who recommended we look into the Omu project. He was chief geologist for Sumitomo Metal Mining and found the Pogo mine in Alaska for Sumitomo. If Irving puts projects into production, your plan is not to build a mill or facility onsite yourself, but rather to supply smelters, is that correct? QH: The rock is rich in silica, and silica is needed by smelters as an agent called flux. Flux is added to copper, zinc or other concentrates and it helps retain heat in the furnace – it acts as an insulator to keep heat in the molten material. It also extracts some of the nastier elements – it takes out iron and other things. So, silica is very important to the smelting process. In Japan, they use perhaps a couple of million tons per year. Traditionally, Japanese gold mines have supplied the sinter for smelters, but as gold mines have diminished in Japan, this has become less and less so. When the ore is added to the furnace as flux, gold and silver come straight out into the copper matte, and they recover them through further refining in the smelter – they are a byproduct of the smelting process. We thus saw a huge opportunity. If we find a high-grade deposit we feel it is easy for us to integrate into the smelter flux market in Japan. It saves us from building a mill, which is capital intensive and requires more permitting. AL: When Omui was in production they shipped ore to the Kosaka smelter back in the 1920s. Kosaka remains a large smelter today in full operation. When we spoke to them two years ago, they said that if we were to make a discovery they would welcome our supply. You have a busy 2019 planned – tell us about the first half of the year and how it sets up the activity in the second half. QH: For this year, we are working on getting our drill program lined up in Omu. We brought a drill rig from Canada and a drilling company we worked with in the past is seeking visas for some of its drillers. Once we get those, we can start drilling, I suspect some time in March. The drill program should last most of the year, say from March to October. We will probably test the Omu sinter first and the Omui mine second. We are also going to conduct trenching and bulk sampling at the Omui mine site. We plan to open up some of the veins with excavators and not only study the geology but extract a bulk sample, say up to 1,500 tons. The plan is to ship the material to the Kushikino mine and smelting complex in Kyushu. They are prepared to handle our material and we are planning on selling it to them directly. Other than that, our focus will be earlier-stage exploration on Hokuryu, which is on the Omu property, and we are also going to undertake greenfield prospecting and mapping on our other projects in Hokkaido. 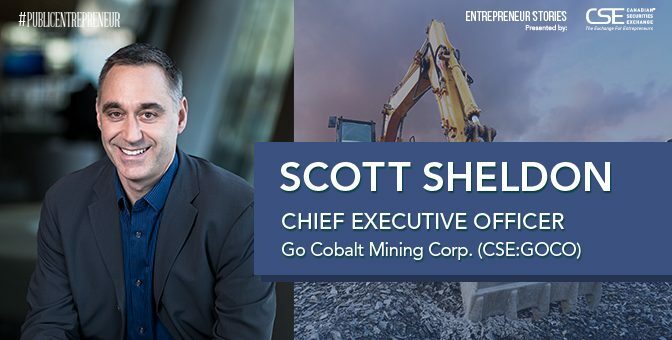 QH: We are one of a handful of exploration companies that have waded into Japan recently, but I would put us at the head of the pack because we have very good relations with the entire Japanese mining community – government, the mining companies, regulators, the towns. We built this company purely to operate in Japan. We have a good Japanese team. I think we are in the best position to make a discovery in Japan. 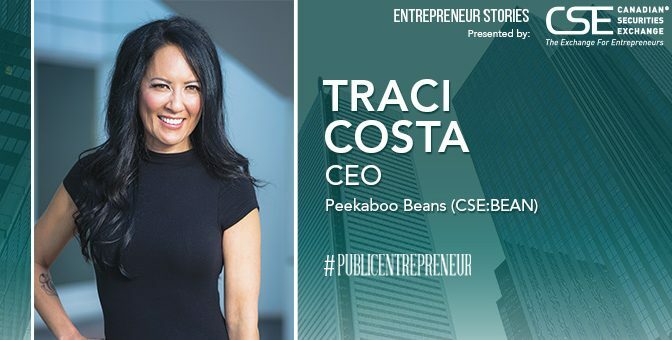 This story was originally published at www.proactiveinvestors.com on March 3, 2019 and featured in the Public Entrepreneur magazine. 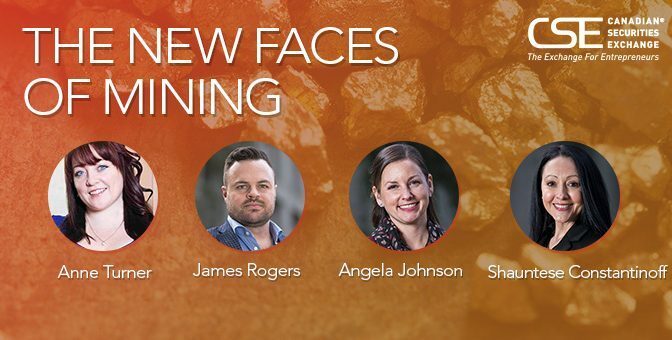 Learn more about Irving Resources at https://www.irvresources.com/. Every week, it seems, brings another concerning story about hackers infiltrating a commercial or government network and making off with highly sensitive information. One would think that with the threat having been clear for so long, entities with significant exposure would have devoted appropriate resources to figuring out how to protect themselves properly. Alas, all too often this seems not to be the case. VirtualArmour International (CSE:VAI) has a solution to this problem, or to put it more accurately, a tailored solution that precisely fits each customer’s risk profile and particular set of network vulnerabilities. Boasting a 100% retention rate across a very broad customer base, the company is obviously doing something right. 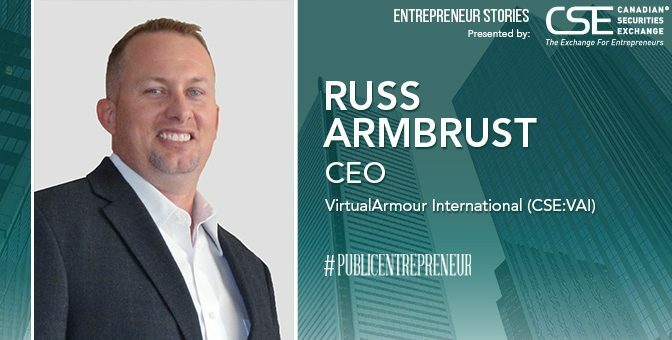 Public Entrepreneur spoke recently with VirtualArmour chief executive officer Russ Armbrust about the state of cybersecurity and what his company does to help organizations stay ahead of the curve. Cyberattacks make the news regularly and the loss of confidence a compromised company suffers can be quite serious. Can you give us your view on the state both of attempts to infiltrate corporate and other networks, and the quality and consistency of efforts being made to counter them? There are constantly new tactics and techniques being developed to compromise IT assets for valuable information. Considering these tactics are continuously evolving, we make it a point to partner with what we consider the best-in-class technology providers who have proven track records of constantly improving their solutions to stay ahead of this evolution. The response landscape of cyberattacks has shifted to a proactive approach, looking for behaviour-based activity as opposed to the signature-based approach. Utilizing emerging technologies like artificial intelligence to maintain a proactive stance against hackers will continue to improve and aid in keeping pace with the way we respond to these threats. As far as the quality and consistency of counterefforts, I would say that 90% of companies are very immature at this right now. That is the reason for the growth of our company. Most of the companies we talk to don’t know what they don’t know. It is a comprehensive process with each of the companies to get them up to the cyber posture they need. Let’s look several years down the road – what do you project as far as the evolution of network security is concerned? The traditional model of network security is being challenged and new technologies are becoming commonplace. Everything soon will be connected to the Internet in some way or another, be it wireless, cellular, Bluetooth or something new. We see that each and every day in commercial advertisements. Now your refrigerator is connected, your oven is connected. With nearly everything expected to be connected, this will produce new attack vectors and require constant development of defense mechanisms and techniques, both proactive and reactive. Walk us through VirtualArmour’s approach to the problem. What are your competitive advantages – what makes you better? And how does the company keep pace with the constantly changing cybersecurity landscape? We focus on customer experience. Everyone’s cyber posture is unique, so our goal is to understand the potential cyber gaps of each customer. We focus on becoming a true partnership and acting as an extension of their team. In today’s world, the new modern MSSP (Managed Security Service Provider) should help a customer solve problems, not just send alerts. And that is our true differentiator. As to how we keep pace, we believe that we have hired some of the best engineers in the business. With such a broad range of customers in so many industries, as well as interacting with our customers’ highly skilled engineers, it enables our engineers to constantly evaluate and stay on top of this ever-changing cyber landscape. Where do you find the majority of cyberattacks are coming from? Are they just people seeing if they can penetrate networks for the challenge of it, or is it cybercriminals seeing if they can enter networks to obtain information and use that to generate profit in some way? Who is who in the zoo out there attacking these networks? It is all across the board. We see attacks coming from the outside to gather information, and we see attacks coming from inside of corporations. It is literally all across the board in terms of how people are trying to penetrate networks. What types of companies choose VirtualArmour to protect them? They don’t necessarily come from any specific industry, but they do have common traits. They typically are highly regulated and lack the proper resources or skillset to deliver what is required on any security practice. We have customers in health care, retail, financial, oil and gas, mining and many others. With the customer service we provide we have been able to maintain a 100% retention rate to date with our customer base. And what is really exciting about that is our typical contract ranges anywhere from one to three years. Our business is built solely around services. Professional services are helping with architecture and projects. And then managed services is where we are the eyes and ears to a company’s network and security. We are monitoring 24/7. We are not just alerting but we are helping with a customer’s entire network. Where you do stand right now in terms of revenue and what is the outlook? As of our reported results for Q2 2018, our managed and professional services increased 78% to a record US$1.2 million versus the same year-ago quarter, and total revenue increased 50% to a record US$4 million. And with our current growth, we are well on track to continue at this tremendous pace. Looking at our margins, you can see our business continues to grow and a favorable shift to our higher margin, managed and professional services business. Are there any industry dynamics people are unaware of right now that you think have the potential to drive more business to VirtualArmour in the long term? Cybercrime is expected to hit US$6 trillion annually by 2021. Due to these numbers they are also expecting cybersecurity jobs to more than triple. This talent pool will remain flat, which is going to create a shortage of talent and make it more difficult for customers to maintain their existing talent. And that will drive customers to sign with companies like VirtualArmour to deliver on all these services. And to wrap things up, how about some client feedback or observations from your team on making sure the companies you serve want to continue working with VirtualArmour. What’s the secret there? I’d point out that we typically come across the same competitors when we compete for an opportunity. What’s really been exciting for us is that we have been coming out on top and it is due to the customer service experience. When we win a new client, I always like to ask them why they chose VirtualArmour and we get the same answer over and over. We truly do take a different approach. We are more customer-focused. We provide playbooks around their business needs rather than telling them they have to do things a certain way. When they meet our engineers during the sales cycle, they come to believe they are some of the best in the business and that makes them comfortable about the services they are going to receive. 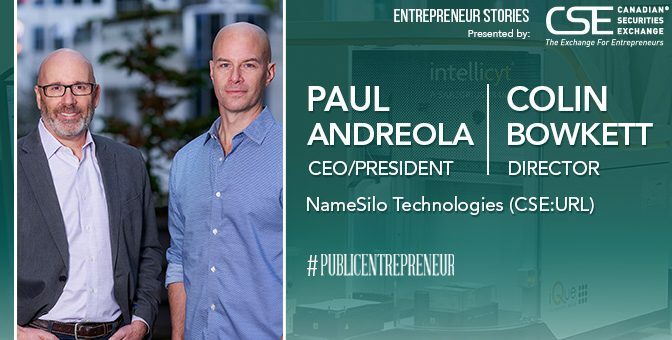 This story was originally published at proactiveinvestors.com on January 3, 2019 and featured in the Public Entrepreneur magazine. Learn more about VirtualArmour International at https://www.virtualarmour.com/.